William B Mitchell’s small labels from Holly Springs, MS – Mitchell and Vimla – don’t seem to have had much – if any - attention at all. And that’s a shame because all the releases that I’ve come across have been strong southern soul. The only artist he worked with to have had any sort of profile has been the excellent Edna Echols, whose “Keep On Walking” has had some dance plays. 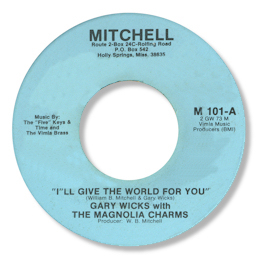 This track first appeared on Mitchell, and the flip had this fine ballad by Gary Wicks. His rich deep vocals, with their touch of Jerry Butler in their tone, brings the tuneful I’ll Give The World For You really well to life. Fine accompaniment from the rhythm section and muted horns as well. The rap in the middle doesn’t sound anything like Wicks and must be another person altogether. Mitchell himself? Odd. UPDATE ~ I'm delighted to say that Arelya Mitchell, the daughter of W B Mitchell, has been in touch. "trust you me everything on Gary Wicks' record is Gary's voice. My father, W.B. Mitchell founded the Vimla label. He and my brother, William B. Mitchell produced and wrote Gary's "I'll Give The World For You". I've asked Arelya for any more info she might have about Vimla and W B Mitchell's other musical ventures and when she replies I'll post the info here. Note ~ The other side of the Mitchell 45 is Edna Echols “Keep On Walking”. The Vimla 45 I know only has the one Gary Wicks track on it. Does anybody know if there is a flip?